View our 100 years of campaigns timeline here. 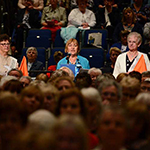 Formed in 1915, the WI has a long history of campaigning on a wide range of issues. Our resolutions and mandates process means every campaign starts within our membership. 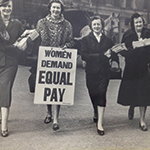 Read more about the wide range of WI campaigns and some recent successes, and see our campaigning history through snapshots going back to 1926. The Public Affairs team have created a monthly e-update on all the latest WI campaigning news. If you would like to receive the Digest please subscribe here. Learn about our campaign to make it as acceptable to talk about mental health as it is about physical health. Find out how we are campaigning to reduce the amount of microplastic fibres entering our oceans. See what members are doing to combat loneliness and raise the profile of the issue in their communities. Discover more about how we are urging supermarkets to tackle food waste and help address food poverty in the UK. Let’s go further and faster to protect our planet. 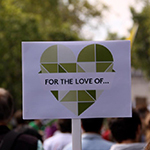 Join our mass lobby for climate and environmental action. The resolutions process ensures that every WI member has the opportunity to set the direction of NFWI campaigns and policy, from the grassroots up. Read the 2018/19 shortlist results and find out more about the next steps for WIs to take.